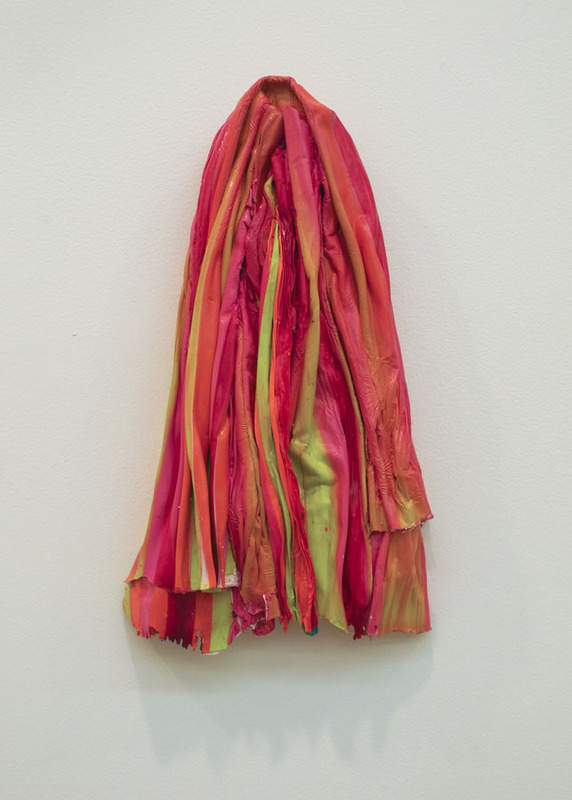 Paint/Rag #36, 2014; oil on panel, 16 1/2 x 9 1/2 x 6 in. 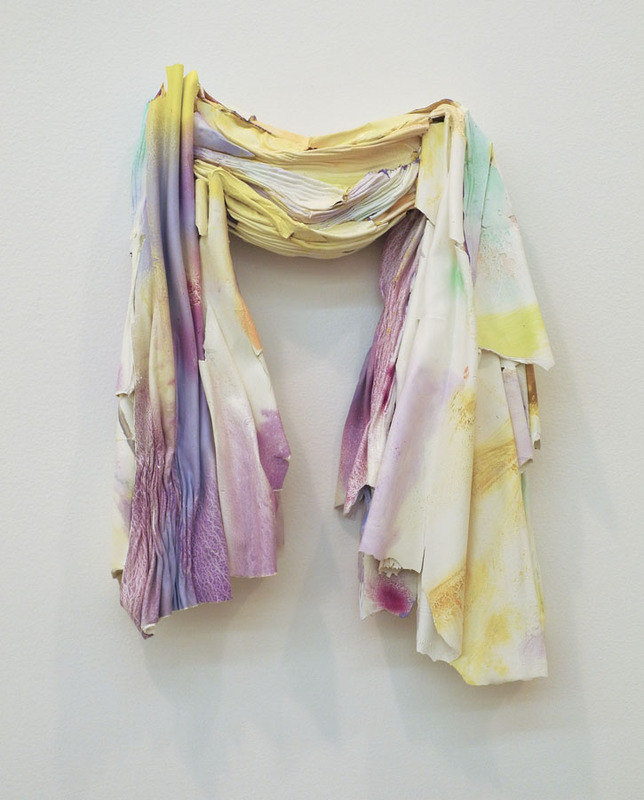 I was totally surprised and delighted when I walked into Jack Shainman Gallery to see Leslie Wayne's exhibition "Rags". I was surprised because they were not what I expected from seeing them online; this was yet another instance that made clear how much we miss seeing work solely onscreen. I nearly didn't see the show because my online viewing had left me with a shrug as a response, which turned out to be so mistaken: I loved it. 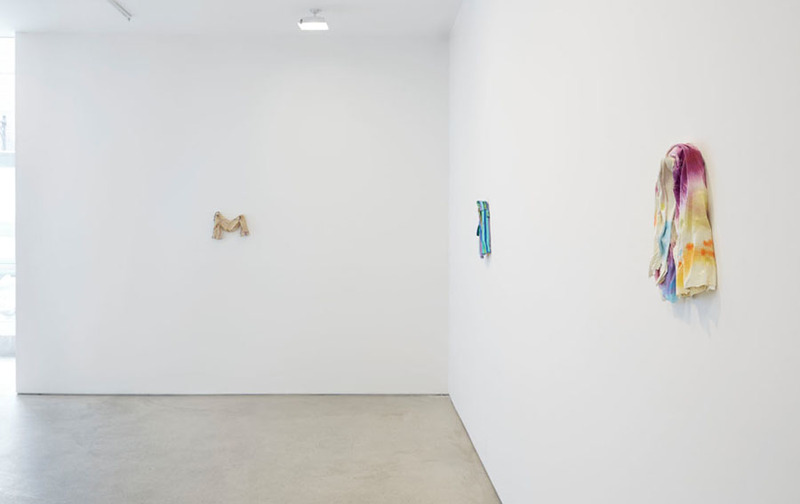 Installation shot courtesy of Jack Shainman Gallery. What I hadn't expected was the modest size of these works, none larger than a foot and a half. Looking at them became an intimate experience, rewarding close looking with a wealth of rich detail. 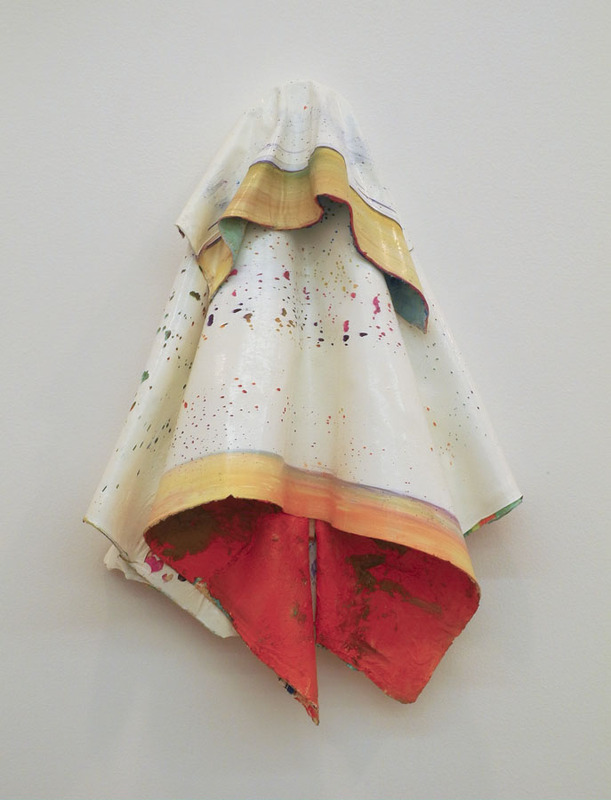 Paint/Rag #30, 2013; oil on panel, 18 1/4 x 12 1/2 x 5 in. The paintings are made of layers of oil paint, just paint; no canvas or other ground holds them together. The panel is used to mount the painting to the wall. 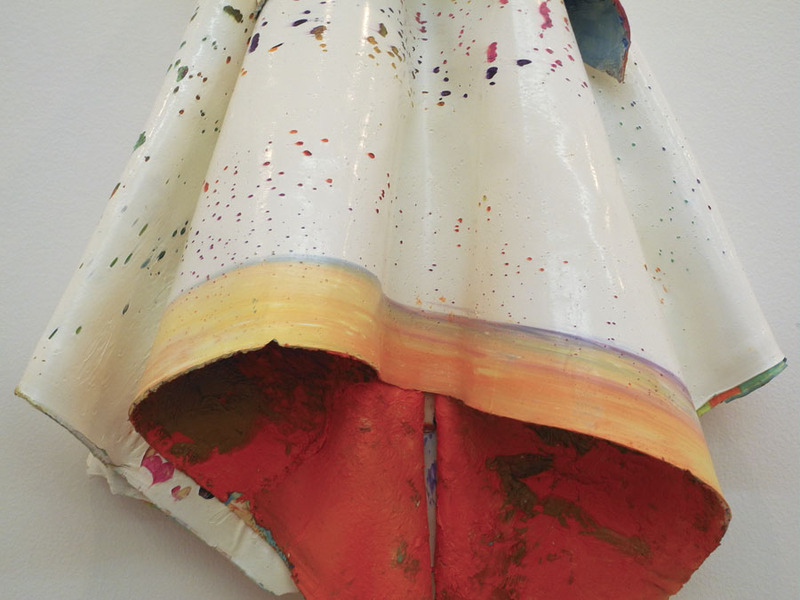 The paint depicts itself, becomes sculptural, is an evocative physical presence. 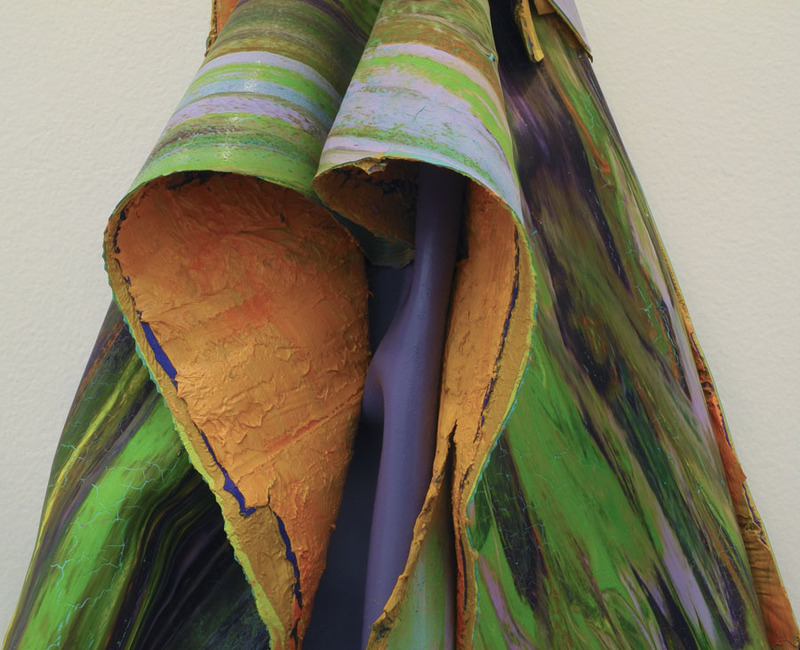 There is a magical alteration in the medium as it becomes solid and folded and draped. Each piece has a different approach to color, surface, and design; the works don't settle into an easy pattern. Paint/Rag #24, 2013; oil on panel, 14 x 10 in. Wayne calls the show "Rags", referring to paint rags, but I had the uncanny feeling looking at this body of work that what I was seeing were prayerful offerings. 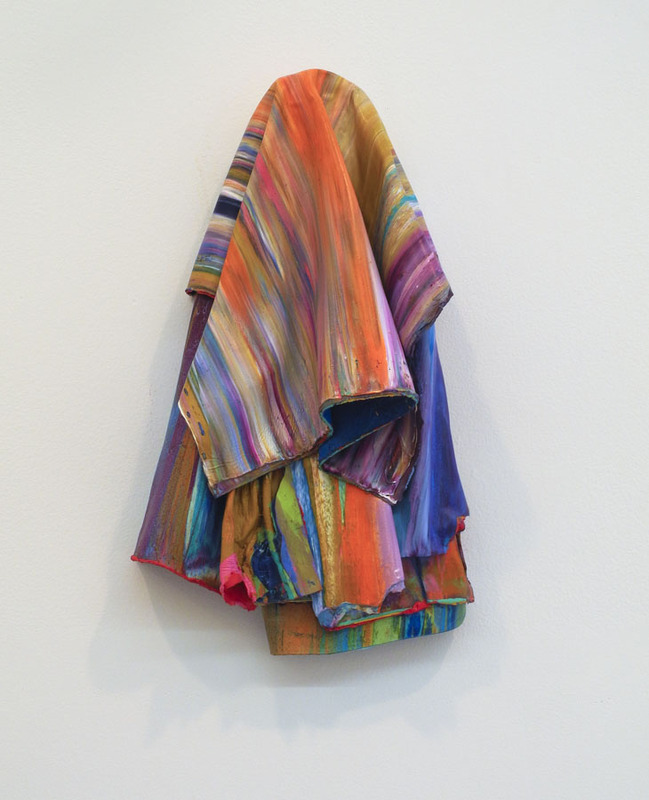 In #24 I feel hands holding the draped cloth aloft, and kept thinking of Joseph's coat of many colors. 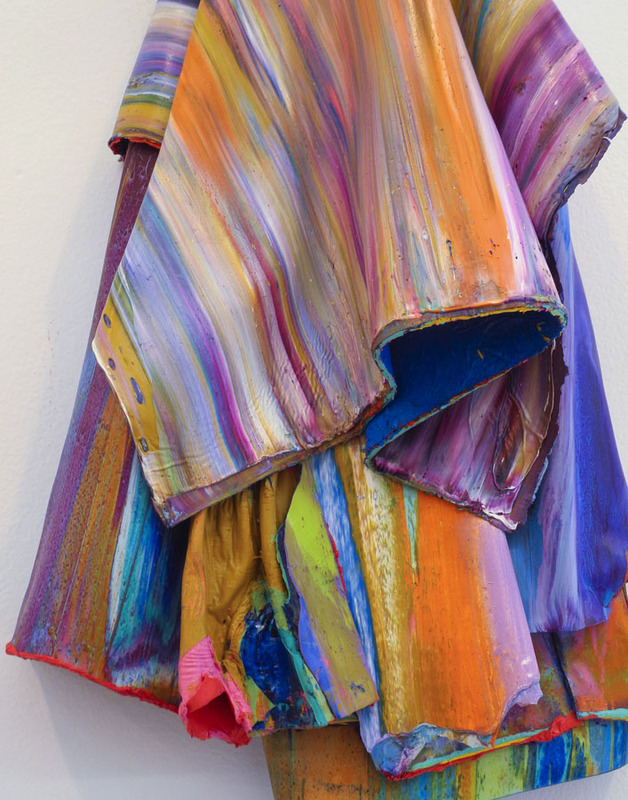 Paint/Rag #19, 2013; oil on panel, 14 x 7 1/2 x 2 1/4 in. 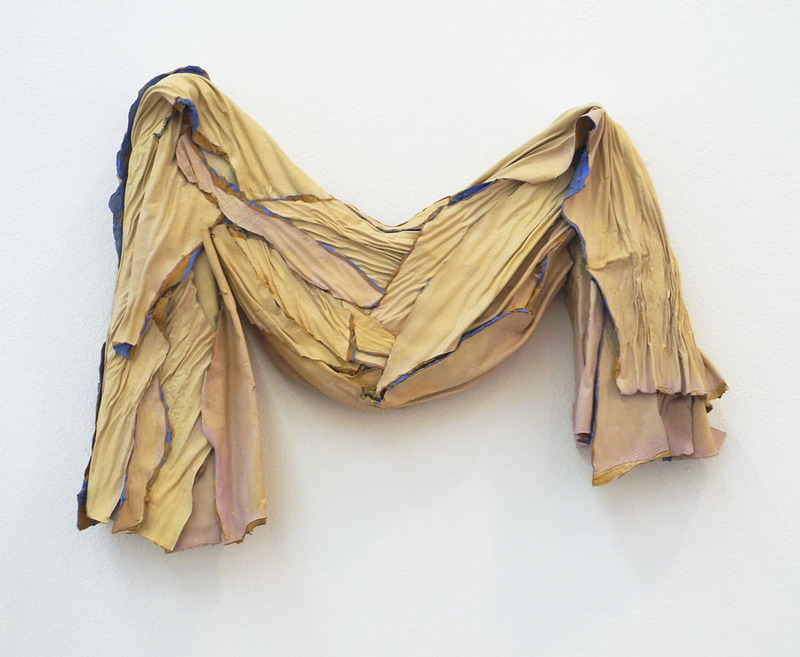 There is a tenderness and vulnerability to images of folded cloth, even when intense in color. It's strange that I have this response since I'm not a religious person, but there is something in the small size of these works and their irregular folds that touches me deeply. Paint/Rag #31, 2013; oil on panel, 14 x 9 x 4 1/2 in. In their forms I am reminded of Medieval and early Renaissance paintings with folds of dresses and cloaks spread out around the Virgin and saints. The surfaces and colors are juicy and rich. Paint/Rag #29, 2013; oil on panel, 14 x 9 1/2 x 5 3/8 in. 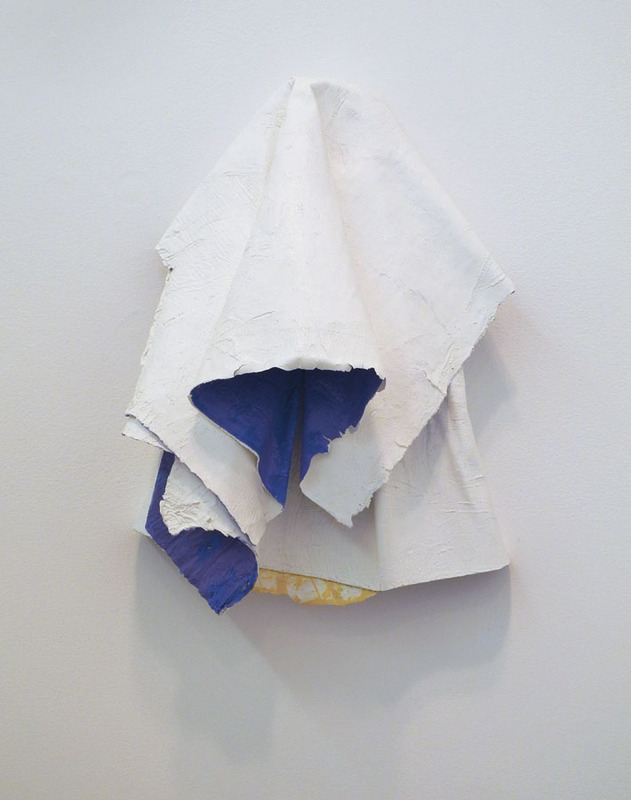 Then Wayne presents an austere cloth, white with a little bit of blue and yellow showing; the paint surface here is matte and seems to be worked with a knife so it has the look of plaster, as though it is the armature for a sculpture. 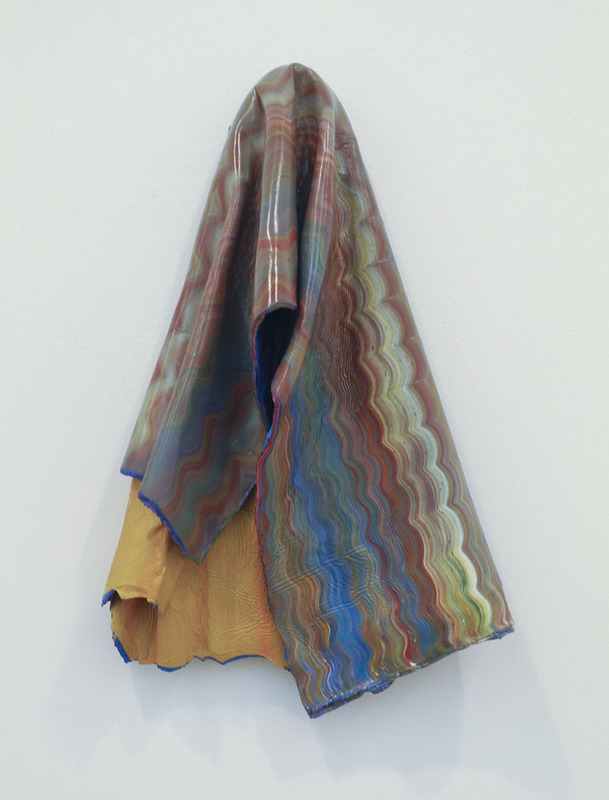 Paint/Rag #32, 2013; oil on panel, 15 x 9 1/2 x 6 in. .....while single colors are revealed on its underside. The orange paint has a drag to it, a gritty texture contrasted with the smoother outer surface. Evidence of small cracks in the paint surface tell of time and change. Paint/Rag #34, 2014; oil on panel, 16 x 10 1/2 x 5 in. The surface of #34 is glossy and smooth, which works well with the regular squiggly lines. The color is colorfully somber, if that's possible as a description. Paint/Rag #21, 2013; oil on panel, 10 1/2 x 13 1/2 x 2 1/4 in. Like with #24, I feel the presence of hands holding up the folds of "cloth". Folds remind us of clothing, so seem so closely related to the body and to human activity. For me this is what gives these works their tender quality. 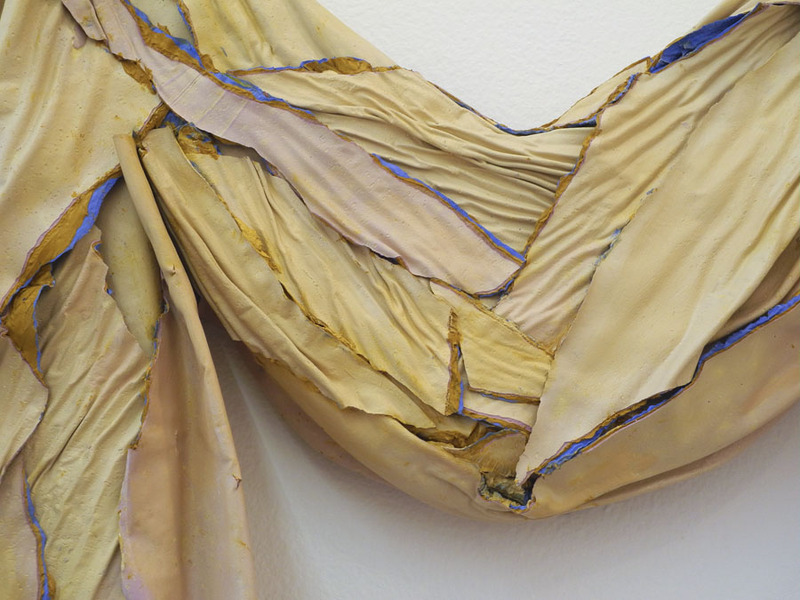 I especially love this piece because of its ambiguity: it shows graceful folds but they are broken and brittle, their edges torn and jagged in places; this creates a subtle emotional tension. Rags are utilitarian things, rescued from other uses, generally tossed about and disregarded. 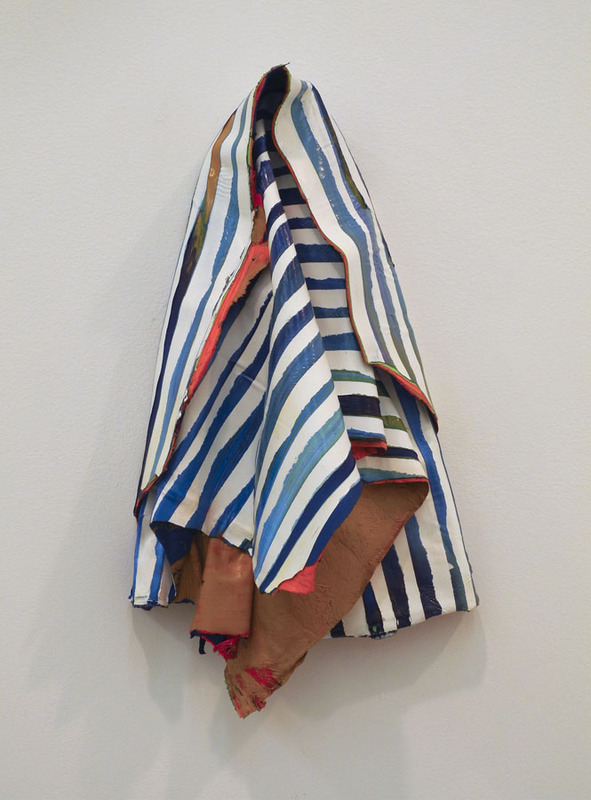 Leslie Wayne's "Rags" are objects to treasure. I don't know if you are referring to the blog post or the paintings, phillip, so I'll thank you for me and for Leslie Wayne. These are fascinating! Would love to see them in person. Thanks for reviewing this show. Thanks for the blog. They do look so beautiful and rich and colourful and tender. One keeps wondering how they were actually made, what the technical challenges were.. Thanks for looking and commenting, Lisa and Ilona. They are marvelous in person, and the fact that they are only paint makes them more wonderful. Yes, it would be interesting to visit Wayne's studio to see how she makes these works. Thanks for posting these images Altoon! 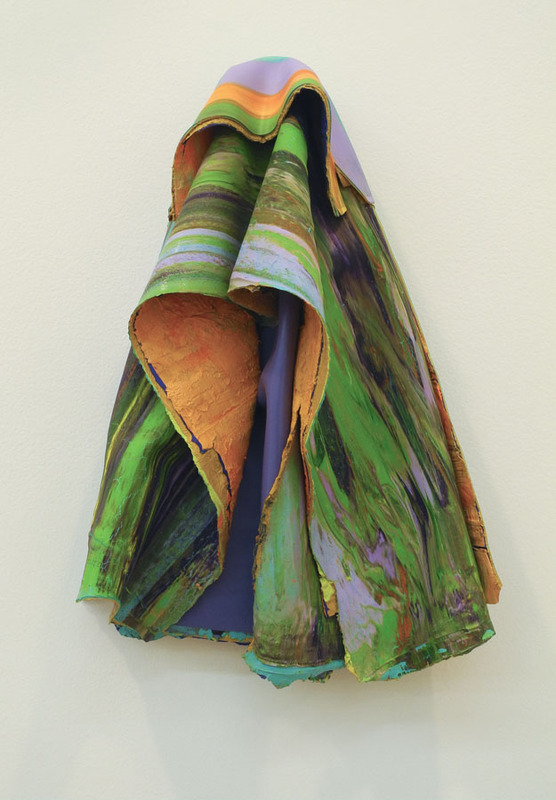 Leslie brings paint to tactile, sculptural abstraction. there are some video interviews in her studio available on line. I agree; she's doing wonderful things with paint. You are very welcome, maureen. The work is so much more beautiful in real life. This is such an amazing artist! All the photographs on this blog are by its author, Altoon Sultan, unless otherwise indicated. If you share an image, please give credit. Click on the image to go to an online version of my egg tempera manual. There is an excellent quality PDF available for a free download. "...we find only the world we look for." "Build therefore your own world"
"Into Great Silence", and living "...with nature in the present..."
Do We Have an Innate Style? On William Gass's "On Being Blue: A Philosophical Inquiry"
Thoughts on Seeing Abbas Kiarostami's "Five: Dedicated to Ozu"
William Carlos Williams: "no ideas but in things"
Spicy Indian Potatoes, "Batata Bhaji"
A New Textile: "Two Ovals and a Rectangle"
A New Boxed Paintings: "Squares"
A New Rug Hooking Project in Progress: "Resting"
When I wake up each morning, I look eastward towards the White Mountains, a grand view that continues to surprise this ex-New Yorker.The land, and the flora and fauna around me provide photographic inspiration, as do my gardens, which feed the body as well as the spirit. The subject matter of my paintings––agricultural implements––is very tied to this rural area; my paintings and drawings are all produced using egg tempera, an ancient medium. The textiles I make can also be seen as relating, in their hooking technique, to a small town craft. My prints use ordinary materials, even garden produce: potatoes. But the paintings, drawings, and prints are strongly tied to modernism, in their form and color. They owe a great debt to abstraction of the 20th century, and I continue to find sustenance in the museums and galleries of New York City. Books and film also inspire thoughts that I wish to share. With this blog I hope to weave together all these various strands of my artistic life. I'm a native New Yorker––from the Flatbush area of Brooklyn––and now paint, make textiles and prints, and garden on an old hill farm in the Northeast Kingdom of Vermont. My works are in many public and private collections, including the Metropolitan Museum of Art in New York, and the Tate Gallery, London.